Nothing is worse than when you’re crafting along at top speed and suddenly realizing you don’t have the right tool in your craft room. Being the creative type, you probably just improvise with what you have around the house rather than stop and head out to the craft store. Even after twenty years of crafting, I still have those “oops I don’t have The Thing” moments, and sometimes there really is no alternative but to hop in the car and go buy The Thing. This handy dandy gift guide is a collection of all the things I’ve had to run out to the store for over the years. If I’ve learned nothing else in my crafty adventures, it’s that everything is easier and turns out better when you use the right tool for the job. If you’re just beginning to exercise your creative muscles, this list will help you build an excellent crafty tool chest. If you’ve been crafting for a while, this list will help you round out your supplies so you can avoid uh-oh moments in the future. And, since the season of gift giving is upon us, it’s the perfect time to add craft tools to your wish list. Print this out, circle what you want, and put it in a conspicuous place (or just post it on Facebook like I will!). There are lots of different kinds of hot glue guns on the market, but the one you need is a high temperature hot glue gun that uses full size glue sticks. With high temperature hot glue guns, your glue has more play when it’s applied which gives you a couple extra seconds to get the positioning of your pieces just right. And, you don’t have to stop every two seconds to reload another glue stick. Because you’re going to be working with extra hot glue from now on, you’ll need a set of curved tip tweezers. They’re not just useful for hot gluing, though! They’re really helpful for beading, placing decals on glass, twisting wire, and positioning tiny bits of thread. Curved tip tweezers are one of the most used tools in my craft room. Buy several, because I promise they will also be the most frequently lost tool in your craft room. You’ll often have to cut through things where scissors aren’t strong enough but a hacksaw is overkill. Cutting pliers to the rescue! I always steal my husband’s from his toolbox, but I really should have my own. Speaking of scissors, you do have multiple pairs of scissors, right? You need at least two pair – one for fabric and yarn, and another for paper. You can spend a LOT of money on scissors (and the maintenance and sharpening that go with them), but for casual crafters just pick scissors that feel good in your hand. I have two pair of Joann Fabric brand scissors with different colored handles – they’re inexpensive, are nice and sharp, and it won’t make me cry when my kiddo uses the fabric scissors to cut paper (again!). A Dremel rotary tool is a little spendy, but once you have one you will use it for everything! Dremels are great for drilling tiny holes, polishing rocks, cutting glass and ceramics, sanding, engraving, and a million other things I don’t even know about. They always go on sale this time of year, especially on Black Friday. Check those sales – the basic kit is fine for beginners, but over the holidays they often come with bonus packs of specialty bits. While you’re at it, pick up some safety glasses and a small respiratory mask – those are must-have safety equipment when you use a Dremel. How many times have you stacked up books and smooshed them together to hold your pieces straight while waiting for glue to dry? Or even worse, had to stand there holding pieces together because it was a weird shape that books wouldn’t help? These little bar clamps will solve that problem and let you enjoy hands-free glue drying! A good, sharp craft knife is a must have for your crafty tool kit. Scissors are great, but we often work in the sub-scissor space and need to cut into tight corners. A craft knife will help you finish the job without folding your project to get into tight spots. These aren’t just for quilters! If you cut anything with a craft knife, this is the best surface to do it on. The grid helps keep your project straight, and the slices into the mat magically repair themselves so your knife doesn’t get stuck in old grooves. This tool does a lot of awesome things, but to me the best part is it functions as a ruler that won’t grow legs or get lost in the bottom of a drawer. The T part fits over the edge of a cutting mat so if you want to mark evenly spaced lines, just line up your straight edge with a grid line and mark away! You don’t have to get a big one – my 24” T square has worked for everything I’ve ever needed. This one is a bonus because it’s not technically a tool. As we move into Daylight Savings Time good light is hard to come by here in the US. An Ott-Lite will not only help you see your crafts better, but will help reduce eyestrain and protect your eye health. This is a must have for any crafting space, and they are usually deeply discounted around the holidays. If you don’t have one, put it on your wish list STAT! So there you have it! 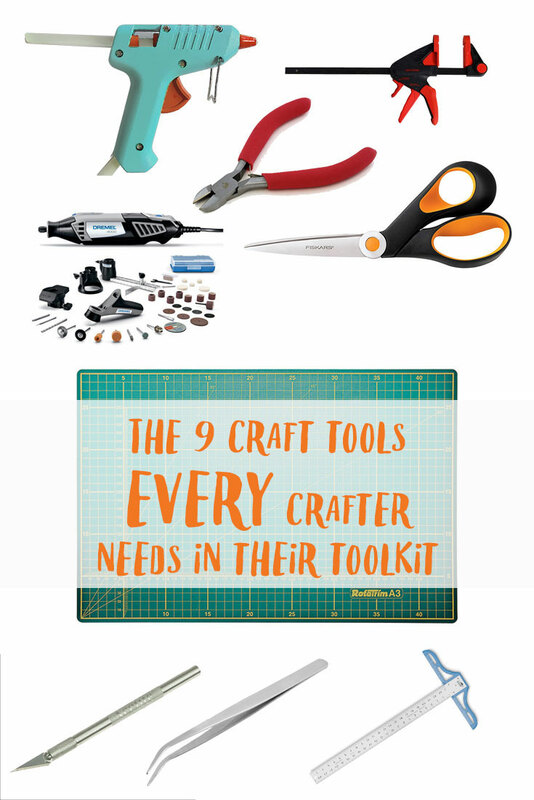 The nine tools every crafter needs to have in their crafty toolkit plus a bonus. You should definitely pin this so you can find it later! Did I miss any? What tools in your craft kit can you not live without?